Anime Limited is like Nintendo. Nintendo hasn't made a Nintendo Direct for 2019 yet, and as a result, people are making rumours and speculation, while 3rd party developers are announcing stuff on Twitter that would be better suited for a Direct. AL hasn't announced anything for 2019, really, and as a result rumours and speculation has started up. In short- what's going on?! I would've expected something by mid-January, but now we're nearing mid-February with nothing. If this is a big year, then why not announce anything? Perfect. Blue. When. The US release uses the exact same transfer bit-for-bit, and yet no word on the AL release? I'm fine with it being delayed if we get anything! At this point, I'm going Sh*t Factory for PB- they may end up having more extras, and with the transfer being 1:1, there's no reason to get the AL release unless that UE is insane (which I hope it is). So why has MVM and manga gave us release dates past this big day, Mainly these are UK BASED companies who primary deal with the UK. 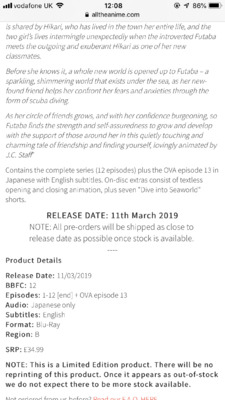 Also production may be affected because the discs are produced (And maybe the books) in EU but still 6 weeks till then and who still thinks we are still leaving on the 29th March I dont. Perhaps they got some stock back like they did for Kill la Kill which then went to the sale? Not to wade this thread down with politics (because I'm so popular when I do that) but the EU themselves have essentially given up on us staying in and no extension has been requested. Government today basically confirmed that the 'meaningful' parliamentary vote will be delayed until just days before the end of March. So we're either crashing out with no deal or parliament is blackmailed in to voting through May's deal at the last second. Like if we were on a crashing plane, out of parachutes and someone offered you their skiddy pants to use as a makeshift one. How does an official distributor mess that up... twice?! But they didn't say I.G was behind it. The packaging describes the studio as JC Staff while I.G served as publisher. Unfortunately for reasons unknown, Funimation have decided to no longer release Dagashi Kashi on DVD or BD. This order will refunded and cancelled. so... for the first 2 months of the 2019 releases we have nothing from AL at all, no word of news, no schedule announcements and nobody on here explaining why. Hmm wonder why, could it be that the Cowboy Bebop UE sold so badly that they took a huge lose on it, Just a thought. Hopefully we get an update by the end of February. Whilst there’s a list of MVM titles I want to get, there’s nothing for AL so far. I know, but the original press release said “lovingly animated by Production IG”. And the initial description on the website said it too. I corrected them those two times.